1. A pair of flask mittens that keep your hands toasty while providing an alcohol blanket. So they can warm their ~spirits~. Get them from Amazon for $16.44. 2. A pair of heated unicorn slippers for anyone tethered to their computer. Just plug them into a computer via USB! Get them from Modcloth for $44.99. 3. A scented candle that crackles just like a real fire. It's available in three wintery scents: mulled cider (with apple and caramel), sweater weather (with cinnamon and clove), and snow day (with balsam and cedar). 4. An L-shaped pillow for anyone in need of a serious cuddle. It will cushion their head while they squeeeeze it right back. Talk about a symbiotic relationship. 5. 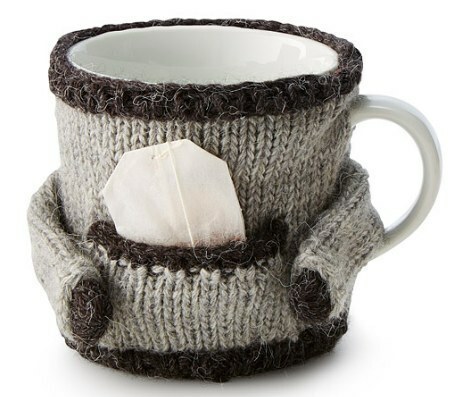 A mug cozy for anyone who wants to hug their morning brew. 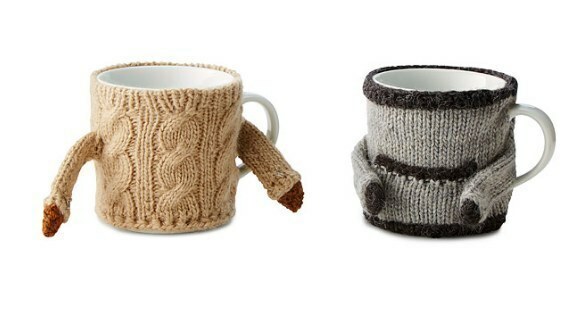 Get the brown one for any coffee fanatic, and the grey one (with a pocket for a tea bag!) for anyone who loves Earl Grey. Get it from Uncommon Goods for $15+. 6. A bath bomb for the person who never wants pumpkin spice season to end. It also has a surprise inside when the bomb melts away. 7. Hedgehog or pufferfish dryer balls for anyone who just loves fresh and fluffy laundry. 8. A Kindle cover that turns their e-reader into a tome straight out of an old-timey library. All the better to curl up with. Choose from one out of 11 book titles. Get it from Klever Case on Etsy for $27.21. 9. A plush dog bluetooth speaker whose bark is rather musical. "Bark," here meaning the sound of your favorite tunes. Get them from PB Teen for $29.99 each. 10. A candle with notes of jasmine, violet, and anise that are instantly relaxing. Get it from Midnight Oil Candle Co. on Etsy for $10.50+. 11. A sweat(er)shirt that speaks their truth. Anyone who thinks otherwise is a fool. Get it from Resilience Streetwear on Etsy for $24.55. 12. An electric mug warmer that keeps coffee piping hot, even in a freezing office. 13. A personalized (with your face!) heating pillow for any ~hot head~ you know. Just pop that baby in the microwave. Get it from Firebox for $19.89. 14. A beanie with a detachable beard that will make any shivering Santa ho-ho-hot. Get it from Macy's for $14.99. 15. A pair of cushiony inserts that transform any pair of shoes into Uggs. Get them from Amazon for $13.99+. 16. A pair of furry earmuff headphones for the Chanel No. 3 in your life. Block out the cold and the haters. Get them from Free People for $28. Also available in four colors. 17. A book of New York Times crosswords that can only be completed under a blanket and/or next to a fire. And/or with a mug of cocoa. Get the left edition from Amazon for $7.99 and the right for $9.32. 18. A sherpa-lined blanket that delivers warmth and cheesy goodness way faster than Dominos. Get it from I Love Decor on Society 6 for $49.99+. 19. A giant plushie for any beautiful cinnamon roll too good for this world.